This book includes chapters on taxonomy, diversity and physiology of blue-green algae as these organisms are most important from biotechnological point of view. Use of algae as biofertilizer, source of natural colours, bioactive compounds, phytochemicals with pharmaceutical and biotechnological applications, food and feed has been discussed. Environmental pollution is the major problem all over the world. The potential of algae in combating water pollution is also highlighted. Depleting fossil fuel is another concern and it is felt that there is a need for alternative renewable resources. Algae as a potential source of biofuel are also discussed in this book. Many advances have been made in the field of biology and biotechnology of algae, especially micro algae. 1. 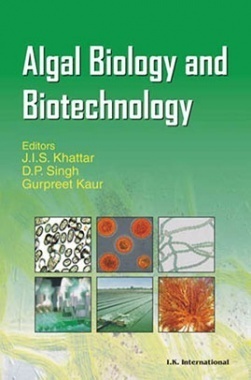 A compilation of 17 chapters, the book encompasses information on advances made in the fields of algal taxonomy, physiology and biotechnology. 2.The subject matter explains various aspects of algae, particularly cyanobacteria, including the roles they play and the challenges faced. 3.The book is contributed by about 50 eminent scientists and academicians.